If there’s any motorsport event that has been going on for a while, it is definitely the 24 Hours of Le Mans endurance race. Held annually at Circuit de la Sarthe in a town near Le Mans, France, this race is the oldest active motorsport, having its first race in 1923. It’s a grueling grad prix with only one demand – race for 24 hours straight without any mechanical failure. While the Le Mans have had its share of several winners in its 89-year history, it’s interesting to see the winning nameplates ever since its inception. Good thing, Budget Direct Car Insurance took their time to compile each of the winners of the Le Mans in this classy viceo. It’s interesting to point out some trends in it, and find out which marque had the most number of wins. Is Le Mans Classic Now The World's Greatest Historic Race Meeting? Most winners of the race were European brands, with the exception of three: Ford in the late ‘60s; Mazda in 1991 with its rotary engine and became the first Japanese carmaker to win the race; and most recently, Toyota with its TS050 V6 Hybrid that won the 2018 24 Hours of Le Mans. 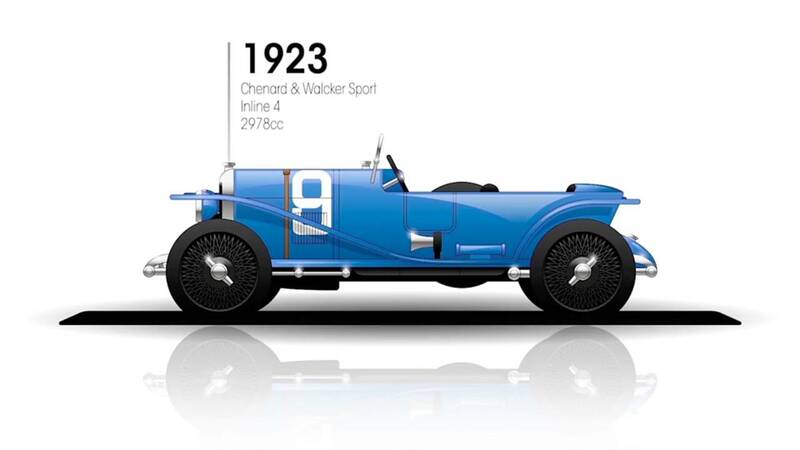 Chenard & Walker Sport was the first to win the 24 Hours of Le Mans in 1923. From this year on, it’s amusing to see that open top race cars rule the day, up until 1952 when Mercedes won with the 300SL. Also, the race was almost done annually, except in 1936 when there was a labor strike due to the Great Depression, and from 1940 to 1948 because of World War II. When the 24 Hours of Le Mans came back in 1949, Ferrari had its first win with the 166 MM. While the Prancing Horse dominated the race from this year on, it’s not the marque that had the most number of wins. In fact, it only had 9 wins in its 16-year dominance, which Ford ended in 1966. With Ford’s win, the Blue Oval’s mission was completed as it specifically made the GT to beat Ferrari in the Le Mans. But it was only a short, four-win streak, which ended in the hands of Porsche, the brand with the most wins in the 24 Hours of Le Mans with 19 wins. The second one was Audi, with 13 wins that all happened at the turn of the millennium. Watch the video or see the gallery below to see all the winners. Now, which brand do you think will win next year’s Le Mans?